A variety of flags on the flag pole outside the historic building which houses the Montreal City Hall in Quebec, Canada. 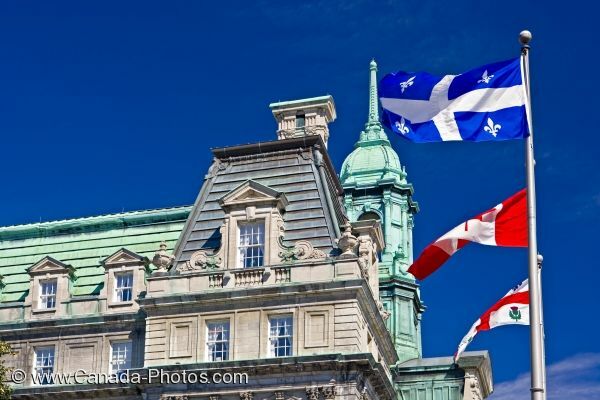 The wind keeps the flags blowing back and forth upon the flagpole which stands outside the Montreal City Hall along the Rue Notre-Dame in Old Montreal, Quebec in Canada. The design of the City Hall is amazing as you see the way each corner, peak and window was created when this building was built back in 1872. Montreal City Hall, Hotel de Ville, and flags along Rue Notre-Dame, Old Montreal, Montreal city, Quebec, Canada. Picture of flags blowing in the breeze outside of the Montreal City Hall in Quebec, Canada.